BEIJING (Reuters) - Beijing is keen to show results after four rounds of policy easing, so China's big banks are playing along, highlighting their efforts to boost lending to cash-starved small firms, offering collateral waivers and setting loan targets. But in reality, banks' loan eligibility requirements for small and medium-sized enterprises (SMEs) remain stringent, making it too difficult or too expensive for them to borrow, according to bankers and company executives. That has forced some small firms, including exporters, to simply give up on borrowing and put investment plans on hold. The health of millions of small firms, most privately owned, is crucial to China's efforts to ward off a sharp slowdown and mass job losses while fighting a bitter trade war with the United States. The People's Bank of China (PBOC) has cut the amount of cash commercial lenders must hold as reserves four times since January. The latest reduction in the reserve requirement ratio (RRR) effective Oct. 15 added more than $100 billion to the financial system, the biggest net injection this year. To guide lending to small firms, authorities have issued directives to banks, arranged meetings between executives of banks and private firms, and doled out tax breaks for banks' "micro-loans". Big banks are keen to show they are heeding the call. Industrial and Commercial Bank of China (ICBC) (Shanghai:601398.SS - News) (HKSE:1398.HK - News), the country's biggest state-controlled lender, says it has opened 230 centers nationwide dedicated to serving small business borrowers. Interest rates on ICBC's loans to small business averaged 4.64 percent in August, it said. That is below the average corporate lending rate of 5.97 percent in the second quarter. 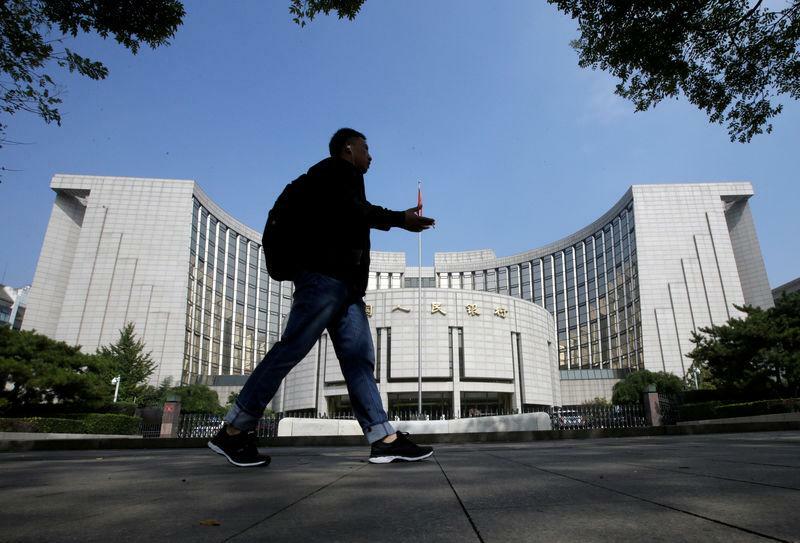 China's monetary policy transmission mechanism is working, as corporate lending rates have been falling month-on-month since June, PBOC Governor Yi Gang was quoted by Chinese financial magazine Caixin as saying in an interview published on Saturday. Agricultural Bank of China (AgBank) (Shanghai:601288.SS - News) (HKSE:1288.HK - News), the country's third-largest bank, has put a cap on lending rates at 7.5 percent above the benchmark lending rate in Wenzhou, according to a local bank official. AgBank has also set a target on loan issuance to small firms in Wenzhou, while some companies do not need to offer collateral if they have sound tax records, the official said. Wenzhou, a bustling port city in Zhejiang province, is known for its entrepreneurs. Other provinces with a high concentration of privately owned small companies include Guangdong, Jiangsu and Fujian, all on the coast. Yet, many small firms say financing conditions remain tight, and official data showed 5.04 million businesses went bust in the first half this year. "There are many ways a bank can make it look as though it's lending to SMEs to meet targets, like lending to multiple smaller subsidiaries with a big parent company, or lending to the supplier of a material to a big company," said a senior banker. Indeed, official data shows new bank loans have surged. Total new loans in the first eight months jumped nearly 19 percent from a year earlier to 11.76 trillion yuan, the latest central bank data showed. That is well on track to set a new full-year record, eclipsing last year's 13.53 trillion yuan. But the increased lending barely compensates for shrinking "shadow" loans, one of the major targets of regulators as they seek to curb systemic financial risks. Off-balance sheet loans used to be a major source of funding for small firms traditionally shunned by the big state banks. Annual growth in outstanding total social financing (TSF), a broad measure of credit which includes off-balance sheet forms of financing, slowed to 10.1 percent in August, a record low. "We have indeed issued much more loans now (to small companies), but in reality, the majority of them still cannot meet our requirements," said the AgBank official. The weakening in domestic demand and increasingly uncertain export outlook have also dented corporate appetite for funds. A lamp factory owner in Guangdong surnamed Cai told Reuters he wouldn't consider taking on more debt given the slowdown in the economy, even with banks offering much lower rates. "Banks want us to borrow more when they are flush with money, but they would recall the loans in advance in less than a year," said Cai. "What use is that to business owners? No industry can turn in profits in one year. Debt is a scourge." The PBOC in August urged lenders not to recall loans blindly, especially to small firms facing operational difficulties. SMEs are viewed as risky by lenders as they have limited quality collateral or government backing in case of default. Cash-flows are often not sufficiently stable to cover interest payments. "In the past, for a big bank like China Construction Bank and ICBC, it was hard enough to provide 10 or 20 billion-yuan loans to small businesses," CCB (HKSE:0939.HK - News) (Shanghai:601939.SS - News) Chairman Tian Guoli said at an industry event in Beijing last week. "That came at a great cost, with non-performing loan ratios of 5-6 percent, or 7-8 percent, or even higher. So banks have no resources or motivation to do so," Tian said, though CCB will try. The outlook for the world's second-biggest economy has been further threatened by the escalating Sino-U.S. trade war. "Most Chinese SMEs are export-oriented and their exports will be affected by the China-U.S. trade frictions," said Cao Yuanzheng, chief economist at Bank of China in Beijing. "That means they are unlikely to invest, and therefore unlikely to borrow funds." Some economists say the PBOC's RRR cuts may have reached the limits of their effectiveness, and big tax cuts may be more effective at boosting growth. Analysts say there is ample scope as tax revenue growth remains high - up 13.4 percent in the first eight months of 2018, according to data from the finance ministry. "Lowering the RRR is good, but it doesn't cure all illnesses," Financial News, a newspaper run by the PBOC, said in a recent editorial.